Some people travel to see historical landmarks, while others travel to get away from the grind. A third group of people, the people like me, travel for the food. There are thousands of delectable restaurants in the U.S. alone, so understanding where to plan your next foodie vacation can seem an impossible task. 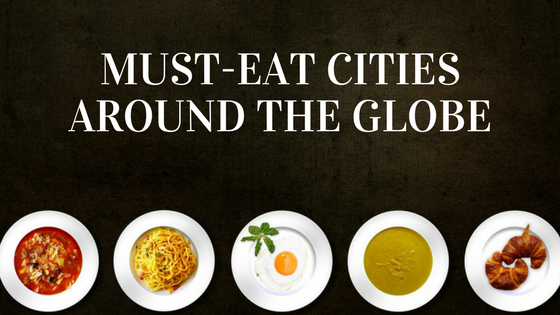 Although it would take years to compile a list of every city for food-lovers, let’s take a look at one city on each continent that boasts delicious meals. Think of East Asian cuisine. Chances are, you thought of Chinese take-out or sushi. South Korean cuisine is so different from other Asian food that you would have no idea they’re so closely related! From kimchi jjigae (a burn-your-mouth-off-hot kimchi stew) to bulgogi (grilled meat), there’s bound to be a Korean dish for every palate. The best part? Korean street food can be some of the cheapest in the world, with most dishes averaging less than $5 USD. The portion sizes are generous, too, so you don’t have to worry about going home hungry. Expert tip: Drinking alcohol is considered a form of bonding in Korea, so brush up on Korean drinking protocol and don’t be afraid to order drinks with your food! Take a page out of Eat, Pray, Love’s travel itinerary and head to Italy for some mind-blowing eateries. Although Rome or Venice might stand out as tourist destinations, Bologna is considered one of the best places to eat in the country. Visit the Trattoria Anna Maria for homemade pasta of all kinds, or bar-hop through the city to taste some of the local fares. Without a doubt, you will feel like part of a big Italian family while working your way through Bologna’s many eateries. Expert tip: Bolognese sauce originated in Bologna and is a required part of your trip. If you’re looking to travel to an up-and-coming foodie destination, Nairobi should be at the top of your list. The Kenyan city is home to all kinds of local fare, as well as international cuisine. Maroc Mama identified “staple foods like ugali (maize meal) and nyama choma (bbq meat) with kachumbari on the side (salsa)” as some of the best regional foods. Trying the local cuisine of Nairobi is bucket-list-worthy. Expert tip: There are many restaurants with websites, so you can make reservations well ahead of time. However, ask a local what the best spots are for authentic cuisine. Sydney is not only the most well-recognizable city in Australia, but is also one of the best places to experience exotic cuisine and fine dining all in one go. Sydney contains beautiful rooftop lounges and waterfront dining. Much of the food in Sydney can be compared to other metropolitan cities, but the local cuisine stands unrivaled. Expert tip: Ever wanted to eat kangaroo? The most well-known Australian animal is up for grabs at dozens of restaurants in Sydney! Lima may not be as popular as other cities in South America, but it does provide some great food. Rocoto Relleno, stuffed spicy peppers, is a spice-fanatic’s dream food. Anticuchos de Corazón, or grilled heart, is a unique meal that is perfect for the more adventurous foodie. If you’re more reserved, don’t let the idea of eating heart turn you away; there are tons of simple recipes prepared around the city that can cater to you. Expert tip: The popular South American dish ceviche is Peru’s national dish. Although it has many variations in other countries, you can’t leave Lima without trying the original. New York City is by far the most foodie-friendly city in North America. Full of trendsetters, NYC has embraced nearly every food craze, from cronuts to freakshakes, and they aren’t stopping anytime soon. Head to New York and you can find almost every ethnic cuisine imaginable, alongside some classic American staples: good burgers, great bagels, and the best pizza. Expert tip: Explore the various ethnic neighborhoods, and don’t be afraid to eat in places that seem sketchy. Quite often, the best food comes from places that look run down. Oh, and don’t you dare enter a chain restaurant during your stay.